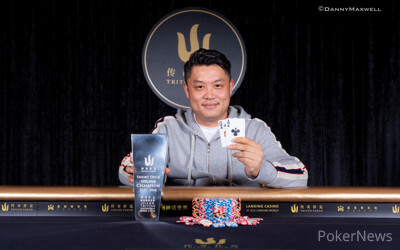 After taking the chip lead on the last hand of the night on Day 1, Ivan Leow capitalized on his advantage and turned his pole position into gold in the HK$500k Triton Hold'em (Short Deck Ante-Only) event. Leow captured the whopping first-place prize of HK$8,470,000, more than $1 million. "It's great. I'm very happy," Leow said in the moments of victory. 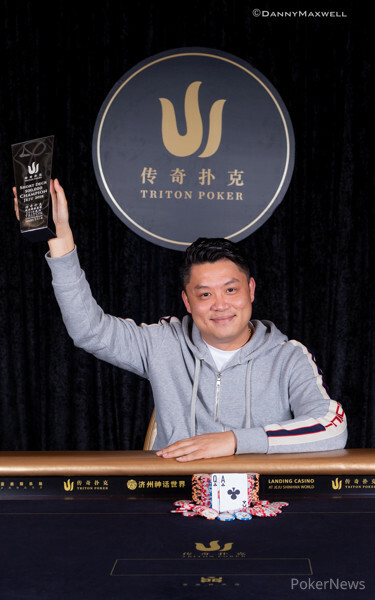 Leow may not be a professional player but he's been showing some fine skills in the newly emerging game this week at 2018 Triton Super High Roller Series Jeju. He arrived in the Landing Resort with an experience from Triton Montenegro where he navigated his way to sixth place in the inaugural Triton Hold'em event. Leow added a min-cash from the HK$100k opening event in South Korea but what will be remembered is his performance in the HK$500k tournament. Not only that he managed to close it out to claim a seven-figure prize, but Leow made it look almost easy. He was landsliding the final table, leaving his remaining opponents far behind for the vast majority of the day. Nobody was able to threaten his stack and Leow steamrolled over an incredibly tough competition. "I've only been playing short deck for a few months," Leow said. "I started with Wai Kin [Yong] and all the crew. We learn the game, it's still a new game," he added. But it's apparent that Leow is now as confident in the 36-card game as anybody. His approach was generally very aggressive. Leow wasn't afraid to keep stabbing in spots where his hand was far from being the winner in the showdown. But he also showed some good feeling for recognizing when was the right time to waive the white flag. Leow maneuvered his big stack with an excellent precision and he just kept trending up until he amassed every chip on the table. "You have to be aggressive. If you play for the win, you must be aggressive," Leow simply explained his strategy. 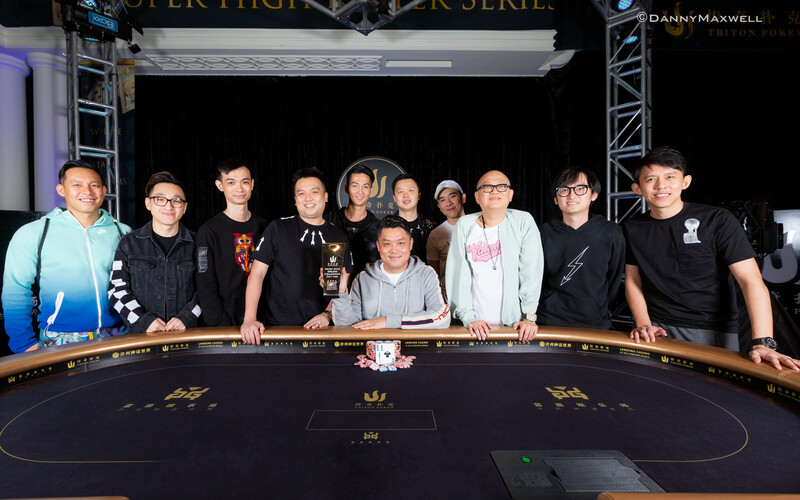 Following eliminations of Chan Wai Leong and Mikita Badziakouski, the final seven players merged to the final table. Leow wasn't the only player putting his chips frequently into the pots. Tom Dwan spent a brief stint at the top after collecting several pots early into the final table. But Dwan lost a big pot on the stone bubble with Rui Cao surviving a critical moment thanks to a good river card. Dwan was downed to a short stack and he would never regroup. He managed to sneak inside the money with Gabe Patgorski falling short, running with king-jack into Leow's aces. Leow vaulted into a big lead and the remaining part of the tournament was heavily lopsided. Leow forced out Dwan in fifth place, and while the tournament hit a deadlock with four players left, Leow kept pulling the strings. He steadily increased his stack to control more than half of all chips in play. The remaining three players just couldn't catch up with him. While Leow mastered the big stack, Jason Koon was utilizing some world class short-stack strategy. It almost looked as if Koon was more comfortable when he played a shallow stack. Koon also found some help when he got it in preflop with jack-nine against ace-queen of Leow. Koon was only a slight underdog but a disastrous flop narrowed his chances to about 1-11. However, running cards gave him a straight and he was allowed to make one more pay jump as he took care of Devan Tang shortly afterwards. Leow had some unfinished business with Koon and the payback came rather sooner than later when they both flopped a set. Koon was on the wrong side of a cooler and after taking down the HK$1 million event in Montenegro, he had to settle for the bronze this time. 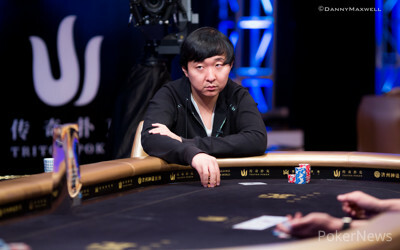 Leow had a comfortable lead coming to the heads-up match against Rui Cao, leading more than 3-1. 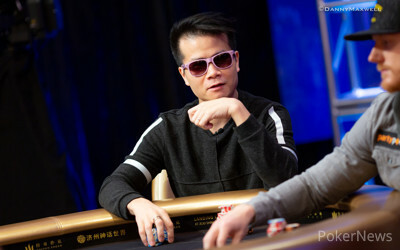 But Cao has arguably been one of the most exciting players to watch in Triton Hold'em so far. He seemed to be very confident in every spot and Leow was very well aware of that. "Rui Cao is very, very good. I think that, in my opinion, he's the best short deck player in the world," Leow complimented his final opponent. But Leow had a better start to the final duel, making a tremendous call on the river after hitting just a nine on a wet board, picking off Cao's bluff with king-high. Then they got it in with Cao having flopped a straight, but he couldn't hold against a superior straight draw as Leow hit a backdoor flush to tackle his rival. While Leow just celebrated the biggest victory of his poker career, there's no such thing as getting tired of winning. "I hope to take down the Main Event," he planned. The marquee event doesn't start until July 30th but there's more action leading up to the pivotal event. And Leow has no intentions of slowing down on his volume. He's already jumped into the HK$500k No-Limit Hold'em 6-Max event which started today. You can follow his journey through PokerNews live updates so make sure to stay tuned to our coverage from Jeju. On the flop of , Ivan Leow jammed on Rui Cao and he instantly called, having flopped a straight with . It was still far from being over as Leow held . The turn brought extra outs for Leow who needed a jack or a club card to close it out. The landed on the felt and Leow's railbirds burst with excitement. Leow took the title along with over $1 million while Cao finished in second place, good for around $673,000. Rui Cao called with and Ivan Leow made it 380,000 on the button with . Cao called. Each player hit a gutshot on the flop and Leow had a middle pair as well. He fired 375,000 in position and Cao check-called. The turn gave Cao a flush draw and both players checked to let the complete the board. Cao led out 650,000 with king-high and Leow made a savage call. Cao immediately gave him the thumb up and Cao's fine bluff catch helped him even extend his already massive lead. 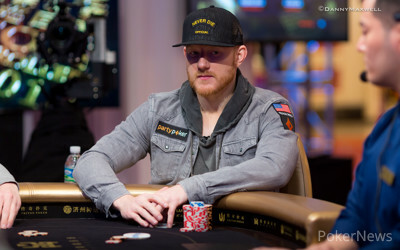 Jason Koon limped with , Ivan Leow raised to 340,000 with and Koon decided to peel the flop, calling. The flop coolered Koon who ended up in a set-under-set situation. He led out 300,000 and Leow made it 900,000. Koon three-bet shoved for 3,085,000 million and Leow snap-called. "Alright," Koon sighed when he saw his opponent roll over the top set. The turn gave Koon a chance to chop the pot should a nine hit the felt but the river didn't save him. Koon, who won the HKD 1 million event in Montenegro, added a bronze here in Jeju, earning another HKD 3,630,000. Ivan Leow made it 300,000 with and Rui Cao flatted with . Cao flopped the nuts on and he opted to play it aggressively. Leow bet 425,000 and Cao countered with a raise to 1,000,000. Leow let it go. Devan Tang limped with ace-king and called for his 1,435,000 when Jason Koon jammed. Koon trailed but he spiked a jack on the turn of the to eliminate Tang in fourth place. Jason Koon limped with and Rui Cao checked with . Koon went for three barrels on the and Cao paid 175,000 on the flop and 200,000 on the turn. Koon, however, jammed the river for 1,365,000 and Cao finally folded his two pair to let Koon get away with his bluff. Rui Cao limped with a suited ace and Jason Koon shoved all in for 870,000 with . Koon ran into Ivan Leow's and the cards were turned up. 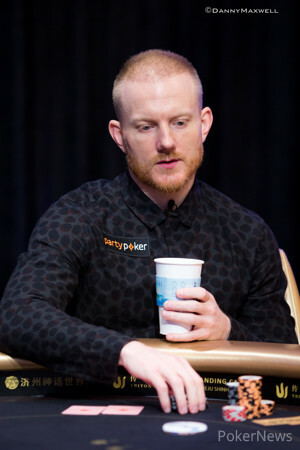 Koon was in terrible shape when the flop came out, having only a 9-percent chance to stay in the tournament. He got some hope when the hit the turn but he still needed to hit a perfect ten on the river. Fortunately for him, the river fell and Koon dodged the deadly bullet, doubling up to 1.9 million.